Via her multi-disciplinary practice, Sarah Al Agroobi explores notions of Emirati stereotypes within both Middle Eastern and Western contexts. There is no single, unifying aesthetic to her work, which ranges broadly across typography, film, sculpture, furniture design, 3D installations, print and time-based media. Her practice mines collective experiences with works that portray an agile simplicity of expression. She devises elegant solutions to cultural conundrums, synthesising complex data or social concepts into expressive sculptures, beautiful interactive infographics and practical solutions. This aptitude has resulted in several significant commissions including art direction and design for the UAE Pavilion at The Venice Biennale, 2014. She holds a Bachelor’s in visual communications from the American University of Sharjah. However, her skills transcend the field, having broadened her expertise exponentially through each innovative project. She is the recipient of several awards, including two Sheikha Manal Young Artist Awards. She has received critical acclaim on the film festival circuit, including a screening at the short film corner at Cannes. Her works have garnered attention from leading design magazines ESTRO, ID and Close-Up and have been exhibited regionally and internationally at Salone del Mobile, Milan (2012), Istanbul Design Week (2014) and The Venice Biennale (2011 and 2014). بإذن من الفنانة ومجموعة أبوظبي للثقافة والفنون. هذا العمل من المقتنيات الفنية لمجموعة أبوظبي للثقافة والفنون. باستخدامها الوسائط المتعددة، تستكشف سارة العقروبي مفاهيم الصور النمطية الإماراتية في السياقات الشرقية والغربية. لا يوجد وسائل فنية موحدة لأعمالها، وتتراوح الوسائط التي تستخدمها بين الخط المطبوع، والأفلام، والنحت، وتصميم الأثاث والتركيبات ثلاثية الأبعاد، والطباعة، والوسائط الفنية المُعاصرة القائمة على تقنية الكمبيوتر. تستكشف أساليبها عُمق التجارب الجماعية بأعمال رشيقة التعابير تبتكر حلول أنيقة للألغاز الثقافية، وتعالج البيانات المعقدة أو المفاهيم الاجتماعية وتحولها إلى منحوتات تعبيرية، ورسوم بيانية تفاعلية جميلة وحلول عملية. أدّت هذه الخصائص إلى تكليفها بالعديد من الأعمال الهامة بما في ذلك الإخراج الفني والتصميم لجناح الإمارات في بينالي البندقية 2014. وهي حاصلة على درجة البكالوريوس في الاتصالات المرئية من الجامعة الأميركية في الشارقة. تتجاوز مهاراتها تخصصها الجامعي، بعد أن وسعت خبراتها أضعافاً مُضاعفة من خلال كل مشروع مبتكر قدّمته. وحازت على عدة جوائز، منها جائزة "الشيخة منال بنت محمد للفنانين الشباب" لمرَّتين. وحصلت على إشادة من النقاد في عدة مهرجانات سينمائية، بما في ذلك الترشُّح في زاوية الأفلام القصيرة في مهرجان كان. وقد جذبت أعمالها الاهتمام من عدة مجلات رائدة في مجال التصميم منها "إسترو"، و "آي دي"، و "كلوس أب"، وقد عُرضت أعمالها في كل من "صالون ديل موبيل" ميلان (2012)، وأسبوع التصميم في إسطنبول (2014)، وبينالي البندقية (2011 و2014). Born into a coastal Al Hammadi tribe of Khor Fakkan, Mohammed Al Astad is an artist whose work epitomises the UAE’s maritime heritage. He employs the forces of his surrounding environment to form evocative statements entrenched in memory. He combines these natural forces with core elements seized from the fabric of traditional Emirati society. By re-appropriating these social and cultural elements as objects of aesthetic appreciation, they become both representational forms and evocative statements of heritage. Incorporating the natural environment in his work, allowing it to literally shape his process, results in works which strengthen the relationship between the natural and the human being. 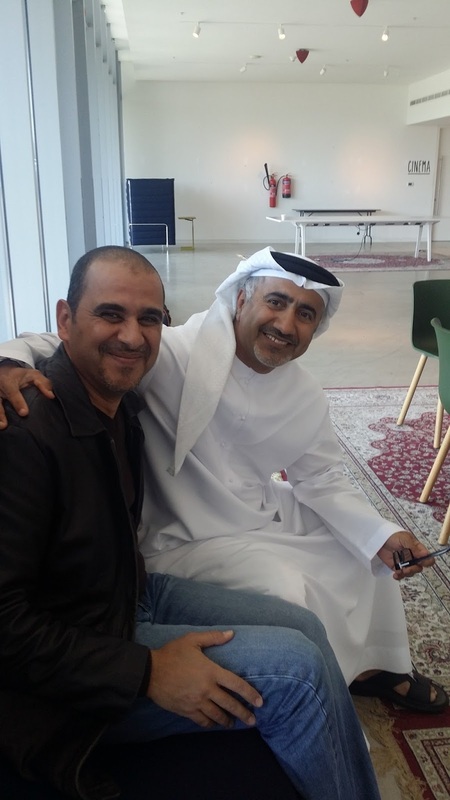 Al Astad was the first Emirati to obtain a Bachelor’s degree in graphic design, graduating in 1998 from the American University, Washington DC. During the last 28 years, he has participated in more than 300 group exhibitions and 20 solo shows nationally, regionally and internationally – including the ADMAF international touring exhibition, ‘Three Generations’ (2013–4). He blazed an educational trail with his creativity centre which, for four years, provided courses in a range of techniques in visual art, design and photography, becoming the the first space of its kind in Abu Dhabi. محمد الأستاد، من عشيرة الحمادي من خورفكان، هو الفنان الذي يُجسِّد في أعماله التراث البحري لدولة الإمارات العربية المتحدة وهو يستخدم قوى البيئة المحيطة به لتشكيل أعمال تترسّخ في الذاكرة، ويقوم بجمع هذه القوى الطبيعية مع العناصر الأساسية التي هي من نسيج المجتمع الإماراتي التقليدي، ومن خلال إعادة تركيب هذه العناصر الاجتماعية والثقافية كمكونات جمالية، فإنها تصبح تمثيلات وبيانات قوية للتراث. سمح له دمج البيئة الطبيعية في عمله، بتشكيلها في أعماله، وأدى إلى إخراجها بطريقة تعزز العلاقة بين الطبيعة والإنسان. 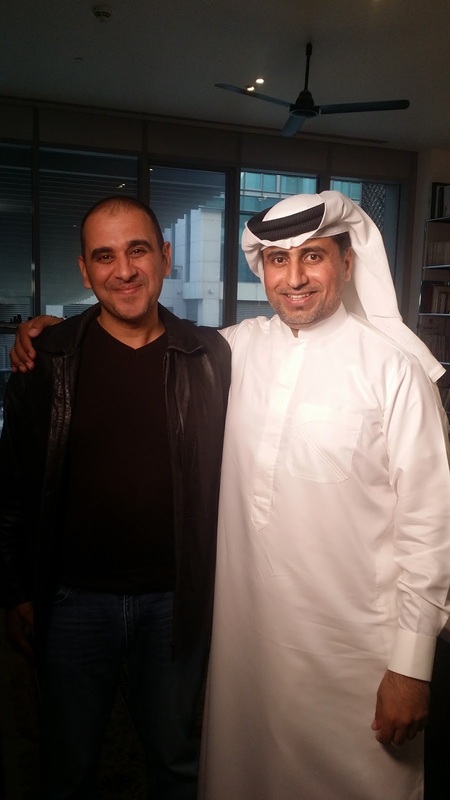 كان الفنان محمد الأستاد أول إماراتي يحصل على درجة البكالوريوس في التصميم الغرافيكي، بعد تخرجه في عام 1998 من الجامعة الأمريكية، واشنطن العاصمة. خلال 28 عاماً الماضية، شارك في أكثر من 300 معرض جماعي و20 معرض منفرد وطنياً وإقليمياً ودولياً - بما في ذلك معرض الجولة الدولية لمجموعة أبوظبي للثقافة والفنون، " ثلاثة أجيال" (2013-4). وقد أنار شعلة التدريب والتعليم بتأسيس مركز الإبداع، حيث قدم ولمدة أربع سنوات، دورات في مجموعة واسعة من التقنيات في الفن التشكيلي والتصميم والتصوير الفوتوغرافي، ليصبح المركز الأول من نوعه في أبوظبي. Khalil Abdul Wahid’s artistic career began under the tutelage of Hassan Sharif, in Al Marsam Al Hur – the atelier Sharif set up in the 1980s. Wahid was so inspired by this privileged learning experience that he made a dual commitment: developing his own practice and passing on knowledge he acquired to the next generation. To that end, he took on teaching roles in the atelier before assuming his current position as Visual Arts Manager at Dubai Culture and Arts Authority. This role facilitates his involvement in diverse projects to cultivate the UAE’s artistic community, from grassroots initiatives through to institutional efforts. This dedication to education and artistic development initially meant his personal practice took a lesser priority. However, he has still managed to carve out two distinct paths – painting and video. His paintings are recognisable through their strong use of colour on dark backgrounds. His experimental video works construct visual metaphors to express ideas related to his culture and environment. He has been exhibited in group shows regionally and internationally including FotoFest’s ‘View From Inside’, USA/Abu Dhabi (2014-15) and ‘Sharjah: Art from the Emirates’, National Museum of Denmark (2010) as well as many of the annual exhibitions of the Emirates Fine Arts Society. بإذن من الفنان ومجموعة أبوظبي للثقافة والفنون. هذا العمل من المقتنيات الفنية لمجموعة أبوظبي للثقافة والفنون . بدأت مهنة خليل عبد الواحد الفنية على يد الفنان حسن شريف، في المرسم الحر الذي أنشأه حسن في الثمانينيات. استفاد خليل عبد الواحد من وحي هذه التجربة التعليمية المتميزة التي خرج منها بالتزام مزدوج: تطوير ممارسته الخاصة، ونقل المعرفة التي اكتسبها إلى الجيل التالي. تحقيقاً لهذه الغاية، أخذ على عاتقه نقل هذه المعرفة في مرسمه قبل توليه منصبه الحالي كمدير الفنون المرئية في هيئة دبي للثقافة والفنون. سهّل هذا الدور انخراطه في مشاريع متنوعة لتنمية الوسط الفني في الدولة من خلال المبادرات الشعبية والجهود المؤسسية. وضع هذا التفاني من أجل التعليم والتنمية الفنية ممارساته الفنية في درجة ثانية على سُلَّم أولوياته. ومع ذلك، فقد تمكن من التميز في مسارين مختلفين - الرسم والفيديو. يمكن التعرف على لوحاته من خلال استخدامه القوي للألوان على الخلفيات الداكنة. أعمال الفيديو التجريبية الخاصة به تبني استعارات مرئية للتعبير عن الأفكار المتعلقة بالثقافة والبيئة المحلية. عُرضت أعماله في معارض جماعية إقليمياً ودوليا بما في ذلك فوتوفست "نظرة من الداخل"، الولايات المتحدة الأمريكية / أبوظبي (2014-2015) و "الشارقة: فن من الإمارات"، المتحف الوطني الدانماركي (2010)، وكذلك في العديد من المعارض السنوية لجمعية الإمارات للفنون. Arab art is at the forefront of the global contemporary scene. International recognition has grown with the surge of artists and institutions that are now acting as ambassadors; formulating the tonality of arts across the Arabian Gulf and beyond. A parallel can be drawn between New York after the Industrial Revolution and the United Arab Emirates today. Post-1900, the US city started to witness the appearance of museums along its streets. Art found its own unique pattern and the thoughts and opinions of those early pioneers were reflected through ‘contemporary art’. It became the documentation of change, of thought and of importance. During the United Arab Emirates’ own state of immeasurable transformation, one can draw the same parallel – an emphasis on what once existed and the fostering of emerging innovation. In an ever-evolving landscape, art in the United Arab Emirates has become an authority; documenting reflections on the past, shifts in social paradigms and the stories of the present. The major voices of the United Arab Emirates art scene in the past 15 years have derived from the combined endeavours of Abu Dhabi, Dubai and Sharjah. In the capital, the Abu Dhabi Tourism and Culture Authority is leading the development of Saadiyat Island Cultural District. The creation of a home for museums such as Louvre Abu Dhabi, The Sheikh Zayed National Museum and Guggenheim Abu Dhabi is underway alongside the Authority’s other cultural focus in preserving the nation’s rich heritage and highlighting cultural expression in all its forms. Also in the capital, the Salama bint Hamdan Al Nahyan Foundation is a not-for-profit entity that supports a wide range of initiatives including arts, culture, heritage and education. Through its partnership with the Rhode Island School of Design, it has established a residency programme to teach artists the importance of process and the need to shift from one school of thought to the next. On that note, the Abu Dhabi Music and Arts Foundation (ADMAF), another not-for-profit, magnifies artistic expression to the highest degree, intertwining the arts (including music) and highlighting the importance of diversity in relation to the overarching cultural umbrella. Through ADMAF, the performing arts is given weight and influence in a predominantly visual arts community. Finally, New York University Abu Dhabi has fast established itself as an academic powerhouse for music, performance and the arts. From one emirate to another, Dubai has taken the commercial lead. Its gallery sector hones in on regional talent, allowing access to an international level of art year-round. Secondly Art Dubai, the region’s leading art fair, attracts international speakers, collectors and galleries, while films are given public screenings. The third emirate that focuses on the arts is Sharjah. A major entity is the Sharjah Art Foundation, an establishment that promotes contemporary art and cultural programmes. The Foundation is also responsible for the SAF spaces, the March Meeting and the Sharjah Biennale; three fundamental bodies that relate to the arts locally, regionally and internationally. Sharjah focuses on bridging the old and the new. Its contemporary spaces co-exist within the Heart of Sharjah, which is registered by UNESCO on its tentative list of world heritage sites – where interruptions of contemporary spaces live within older homes and structures once occupied by those living there. A major game-changer for the arts from the United Arab Emirates internationally is the representation of the country at the Venice Bienniale by a pavilion supported by The Salama bint Hamdan Al Nahyan Foundation. In addition to presenting national artists, it also provides an immersive internship programme for those interested in pursuing careers in the field. The infrastructure of the national art scene has been forged by these institutions and by these emirates that each possess individual characteristics and play a fundamental role in the development of a fully integrated cultural sector. Large-scale projects have certainly contributed to a a cultural renaissance in the United Arab Emirates. Through them, the arts has begun to flourish. However, one must delve deeper in order to understand the validity of the arts. What is particularly distinctive to the United Arab Emirates is that many institutions were initially submerged. As time passed, movements and thinkers of and within the arts started to gain in number and visibility. The usual sequence of events is that movements are created by artists and institutions to satisfy demand. Certainly there was already a basis and an awakening in contemporary thought but this new groundwork really harnessed the arts and supported career progression. It reintroduced the arts into the mainstream and improved the potential for broad engagement. These entities provided a sudden gear-shift that opened new doors. It can be argued that the physical change of the landscape is a contributing factor to the emergence of the art scene in the United Arab Emirates. The assertive, top-down approach has controlled visible growth within the realm of art. The involvement of the government in relation to projects, both public and private, has allowed for rapid clusters of progress. The consistent support has permitted a fluidity in the increased sophistication of discourse which has allowed for an undeniable force and rigour to pulsate through all tiers of culture. Due to this style of implementation, there has been both a pull back and a forward growth in regards to heritage and the arts. Everything is bound by a degree of certainty. Change has consumed the landscape. In turn, its sudden transformation has altered the culture, heritage and identity, sequentially creating a distinctiveness in the nature of the art being produced nationwide. The dialogue with history and the present has attempted to make sense of the large strides that have moved not only the art scene forward but also other sectors. It has begun to chip away at what it means to be in and a part of such evolution. Although the idea of transience is one studied heavily by Emirati artists today, as temporality has always existed. The malleability of surroundings and the strength of impact any small change can cause, has proven to be a nourishing pool of inspiration. The United Arab Emirates acts as a crossroads for myriad cultures and is a platform for many. A place of transience and ephemerality, the country allows for many to participate in its story. This exchange has elevated art to an international level both conceptually and theoretically. Over the last 15 years, the label of ‘Emirati Artist’ in the United Arab Emirates has emerged. In parallel, international recognition of the ‘Arab Artist’ has gained momentum. Both titles – initially glorified then challenged as stereotypes – have slowly given rise to an assertion of responsibility in which questions and blurred lines are addressed and investigated; pushing the envelope as to define what it is to be of this region. Through the responses to these labels, one can study the evolution of thought and practice and further understand the significance of these nuances within the overall development of the arts in the United Arab Emirates. The roots of a contemporary mind-set began in the 1970s. From then until the late 1990s, a group of artists, writers and thinkers were formulating what we now see as the backbone of contemporary thought in the United Arab Emirates. Before this movement, various forms of traditional art had existed; from poetry and dance to storytelling. The development of styles and the paths of thought between the traditional and the contemporary allows us to comprehend the depth of the arts today. The fluid ties between the first generation and those who have followed is a critical aspect of the strength, complexity and composition of the current arts scene in the United Arab Emirates. Furthermore, an understanding of the relationships between the generations and the bridges that bond them has put to sleep criticisms around a lack of authenticity (the legitimacy of the country’s ‘Art Spring’ has been subject to intense debate internationally). In order to understand the art of the present United Arab Emirates, one must take into consideration the relativity of time and the importance of both recent and ancient history. In order to truly understand what art is and what art will become in the United Arab Emirates, one must explore that which lies beyond the ambitious, headline-grabbing projects. A fuller understanding of the nation’s culture and heritage is now gaining greater impetus as more seek to discover how the past has made the Emirates what it is today. As more and more voices participate in the arts, the cacophony of discourse created will undoubtedly lead to core schools of thought taking shape. The identity of the United Arab Emirates today is multi-faceted and complex – far beyond a single culture, a preoccupation with seeking beauty in the mundane, and a sense of nostalgia in spaces that jettisons one back to a simple past. There is an internationalism that is part of this country, one which could easily give it a whitewash if misunderstood, numbing expression. However, the arts gives that internationalism a sense of identity and uniqueness. The United Arab Emirates is a place where many come together under one umbrella to engage and exchange ideas. It is a place where there is more than one identity or school of thought. Through the legacy of artistic expression and cultural initiatives, the United Arab Emirates will, in time, possess an archive that documents the shifts around what is important to the society of the time and why. The governmental presence is a vital factor in the growth of the arts sector and coupled with the modernist and contemporary shifts in thought that took place in the 1970s, a solid foundation is being formed; one which is allowing for everything that is seen on the ground in the United Arab Emirates to take root. In a place where art was dismissed as just a hobby, an awakening has taken place as the government, non-profit and commercial sectors breathe new life into the sector. Large strides have been made, which will be the subject of intense study in the years ahead. Art is a fundamental part of the social, academic and cultural infrastructure of any country – and no more so than in the United Arab Emirates. Munira Al Sayegh is Programmes Officer of Guggenheim Abu Dhabi at the Abu Dhabi Tourism and Culture Authority. She was the Assistant Curator of ‘Emirati Expressions IV: Conventions of Arts’ and previously served as assistant curator of A.i.R (Artist in Residence) at Art Dubai and Assistant Producer of the NYU Abu Dhabi Cultural Heritage Project. يتصدّر الفن العربي في الوقت الراهن طليعة المشهد الفني العالمي المُعاصر، وقد تصاعد الاعتراف الدولي بارتقاء موجة من الفنانين والمؤسسات التي تعمل بمثابة لبنات البناء للفنون في منطقة الخليج العربي وخارجها. يمكن تشبيه حال المشهد الفني في دولة الإمارات العربية المتحدة بالساحة الفنية في نيويورك بعد الثورة الصناعية. ففي بدايات القرن العشرين بدأت نيويورك تشهد ظهور مكثف للمتاحف على طول شوارعها، ووجد الفن أساليبه الفريدة وانعكست أفكار وآراء الرواد الأوائل من خلال "الفن المعاصر"، وأصبحت بمثابة توثيق للتغيير والفكر والأهمية التي تشهدها الساحة الفنية. يمكن للمرء، من خلال التحول المُذهل لدولة الإمارات العربية المتحدة، استرجاع نفس التجربة حيث التركيز على الماضي مع تشجيع الابتكارات الناشئة. في هذا المشهد المتنامي، صار للفن في دولة الإمارات مكانة قوية؛ تعمل على توثيق الماضي والتغيرات في الأنماط الاجتماعية واللحظات الراهنة. هذا وقد تصاعدت وتيرة المشهد الفني في دولة الإمارات في السنوات الخمسة عشرة الماضية بتضافر الجهود من قبل كل من أبوظبي ودبي والشارقة. في العاصمة، عمدت هيئة أبوظبي للسياحة والثقافة إلى تطوير المنطقة الثقافية في جزيرة السعديات، ويجري الآن إنشاء موئل للفنون متمثلاً بمتحف اللوفر أبوظبي، ومتحف الشيخ زايد الوطني، ومتحف غوغنهايم أبوظبي. تقوم الهيئة برعاية العديد من الأنشطة الثقافية التي تهدف الى الحفاظ على التراث الغني للأمة وإبراز التعبيرات الثقافية بكل صورها وأشكالها. كذلك في العاصمة أبوظبي، قامت مؤسسة سلامة بنت حمدان آل نهيان، وهي مؤسسة غير ربحية، برعاية ودعم مجموعة واسعة من المبادرات في مجالات الفنون والثقافة والتراث والتعليم، ومن خلال شراكتها مع كلية رود آيلاند للتصميم، قامت بتأسيس برنامج الإقامة لتعليم الفنانين بطرق عملية وتوجيههم نحو أهمية التعرف على المدارس الفكرية المتعددة. في نفس التوجه، قامت مجموعة أبوظبي للثقافة والفنون، وهي مؤسسة غير ربحية كذلك، برفع مستوى التعبير الفني إلى أعلى درجة، ورعاية مختلف انواع الفنون (بما في ذلك الموسيقى)، وتسليط الضوء على أهمية التنوع في الساحة الثقافية بمجملها. ساهمت مجموعة أبوظبي للثقافة والفنون، بإبراز مكانة الفنون المسرحية وتأثيرها في مجتمع الفنون البصرية، ومؤخراً، احتلت جامعة نيويورك أبوظبي موقع الصدارة كصرح أكاديمي لتخصصات الموسيقى والأداء والفنون. من إمارة إلى أخرى، أخذت دبي زمام المبادرة من الناحية التجارية، حيث يقوم قطاع المعارض في دبي بصقل المواهب الإقليمية للوصول إلى المستويات العالمية. يستقطب "آرت دبي"، وهو من المعارض الفنية الرائدة في المنطقة، المتحدثين، وجامعي الأعمال الفنية، والمعارض من جميع أنحاء العالم، مع إتاحة الفرصة للجمهور لمشاهدة الأفلام. أما في إمارة الشارقة فقد كان لها دور هام في رعاية وتشجيع الفنون في الدولة. تُعد مؤسسة الشارقة للفنون من كبرى المؤسسات الراعية للفن المعاصر والبرامج الثقافية، وهي المؤسسة التي تقف وراء كل من "المباني الفنية لمؤسسة الشارقة للفنون"، و"لقاء مارس"، و"بينالي الشارقة"، وهي ثلاثة مؤسسات تعمل على رعاية ودعم الفنون محلياً وإقليمياً ودولياً. تُركِّز الشارقة على جسر الهوة بين القديم والجديد، وتتعايش المساحات المعاصرة مع القديمة في قلب الشارقة، التي جرى تسجيلها من قبل منظمة اليونسكو على القائمة المبدئية لمواقع التراث العالمي حيث تتجاور المساحات المعاصرة مع المنازل والأبنية القديمة. من الأمور التي عملت على تغيير المشهد الفني للدولة على الساحة الدولية تمثيل البلاد في "بينالي البندقية" بجناحها الذي أقامته مؤسسة سلامة بنت حمدان آل نهيان. توفِّر المؤسسة، بالإضافة إلى تقديم الفنانين المحليين، برنامج تدريب داخلي للراغبين في مزاولة المهنة في هذا المجال. جرى صياغة البنية التحتية للمشهد الفني في الدولة من قبل هذه المؤسسات ومن هذه الإمارات التي تمتلك كل منها خصائص متفردة تلعب كل منها دوراً أساسيا في تطوير القطاع الثقافي بشكل متكامل. وقد ساهمت مشاريع واسعة النطاق بالنهضة الثقافية في دولة الإمارات العربية المتحدة، ومن خلالها، بدأت الفنون بالإزدهار. مع ذلك، يجب على المرء أن يبذل المزيد من الجهد لسبر أعماق تلك الحركة الفنية. ما هو الأمر الذي يميز دولة الإمارات والذي يدفع العديد من المؤسسات للخوض في غمار المشهد الفني فيها؟ بمرور الزمن، بدأت الحركات الفنية والمفكرين في الوسط الفني بالتزايد، ووفقاً للتسلسل التقليدي للأحداث تنمو الحركات والمؤسسات الفنية لتلبية الطلب في المجتمع. بالتأكيد كان هناك بالفعل أساس وصحوة في الفكر المعاصر وعمل هذا الأساس الجديد على تسخير الفنون والتدرج فيها، وإعادة تقديم الفنون إلى المجتمع وتحسين قدرتها على المشاركة، ووفرت هذه الهيئات الجديدة الدافع للتحول وإتاحة فرص جديدة. كان التغيير العمراني هو أحد العوامل التي ساهمت في بروز المشهد الفني في دولة الإمارات العربية المتحدة، حيث سيطر النهج الحازم والتوجهات القيادية على النمو في مجال الفنون. أدَّت المُشاركة الحكومية في مشاريع القطاعين العام والخاص، إلى تحقيق قفزات سريعة من التقدم، وصار الدعم المتواصل بمثابة القوة الدافعة في نمو الحركة الثقافية على جميع المستويات. لقد عملت التغييرات والتحول المفاجئ على استهلاك المساحات الطبيعية، وإحداث تحولات في الثقافة والتراث والهوية، وإضفاء صبغة خاصة على طبيعة الفن المُنتج على الصعيد الوطني. جرى حوار بين الماضي والحاضر لمحاولة فهم الخطوات الكبيرة التي حصلت ليس فقط على الساحة الفنية ولكن أيضاً في قطاعات أخرى، وشرع في تشذيب ما يعنيه أن تكون في خضم هذا التطور وجزء منه. على الرغم من أن فكرة "العبور" هي من المواضيع التي يتناولها الفنان الإماراتي بشكل كبير اليوم، لا تزال فكرة “العرضية" حاضرة كذلك، وقد ثبت أن القدرة على تطويع البيئة المحيطة ودرجة التأثر الناجمة عن أي تغيير طفيف، هي من مصادر الإلهام للفنان الإماراتي المُعاصر. تقع الإمارات اليوم على مفترق طرق لثقافات متعددة وتعتبر بمثابة منصة للعديد منها، وكمكان للعبور والمرور السريع. فتحت الدولة المجال للعديد من الثقافات للانضمام إلى مسيرتها، وارتقى هذا التبادل الفني إلى المستوى الدولي. على مدى السنوات الخمسة عشرة الماضية، برزت تسمية "الفنان الإماراتي" في الدولة. في موازاة ذلك، اكتسب اسم "الفنان العربي" الزخم على الساحة الدولية، أدى إلى زيادة التأكيد على أهمية التطرق للأسئلة والخطوط المموهة والدفع نحو إعادة تعريف المنطقة وما يجب أن تكون عليه. من خلال هذا، يمكن للمرء دراسة تطور الفكر والممارسة وفهم أهمية هذه الفروق في التنمية الشاملة للفنون في دولة الإمارات العربية المتحدة. بدأت الجذور الفنية الفكرية المعاصرة في السبعينيات، ومنذ ذلك الحين وحتى أواخر التسعينيات، قامت مجموعة من الفنانين والكتاب والمفكرين بصياغة ما نعتبره الآن العمود الفقري للفكر المعاصر في الدولة. قبيل هذه الحركة، كان هناك أشكال مختلفة للفن التقليدي كالشعر والرقص الشعبي ورواية القصص. يسمح تطوير أساليب ومسارات الفكر بين التقليدية والمعاصرة بفهم عمق الحركات الفنية المُعاصرة، وتعتبر العلاقات الوطيدة بين الجيل الفني الأول والجيل اللاحق جانب أساسي من القوة والترابط والتركيب الخاص بالساحة الفنية الحالية. علاوة على ذلك، أسكتت تلك العلاقات بين الأجيال والجسور التي تربطهم الانتقادات حول عدم وجود الأصالة في الفن (خضعت شرعية "الربيع الفني" في الدولة لنقاش مكثف على الساحة الدولية). من أجل فهم واقع الفن الحالي في دولة الإمارات العربية المتحدة، يجب على المرء أن يأخذ في الاعتبار نسبية الزمن وأهمية كل من التاريخ الحديث والقديم. لكي نفهم حقا ما هو الفن وما سوف يصبح عليه في الدولة، لا بد من استكشاف ما يكمن وراء المشاريع الطموحة، التي تحتل عناوين الصحف، وبزيادة الفهم الشامل للثقافة والتراث يبدو أن الكثير مهتم بمعرفة كيف أثَّر ماض الدولة في صياغة حاضرها. وبمشاركة المزيد والمزيد من الأصوات في مجال الفنون، سيؤدي الحوار واختلاف الآراء بلا شك إلى تشكيل مدارس فكرية خاصة بدولة الإمارات. هوية دولة الإمارات العربية المتحدة اليوم متعددة الأوجه ومعقدة، وأبعد ما تكون عن ثقافة واحدة. من السعي نحو الجماليات في الأمور الدنيوية، إلى الشعور بالحنين إلى المساحات التي تعيد المرء مرة أخرى إلى الماضي البسيط، هناك عالمية أصبحت جزءاً لا يتجزأ من هذه الدولة، والتي يمكن أن يتجاهلها المرء بسهولة إن أساء فهمها ومع ذلك، تمنح الفنون شعوراً بالهوية والتفرد. دولة الإمارات العربية المتحدة هي المكان الذي يجمع العديد من الناس معاً تحت مظلة واحدة للمشاركة وتبادل الأفكار، إنها المكان الذي ينبض بأكثر من هوية أو مدرسة فكرية واحدة. من خلال إرث التعبير الفني والمبادرات الثقافية، ستمتلك دولة الإمارات العربية المتحدة، مع مرور الوقت، أرشيفاً يوثق التحولات حول ما كان مُهمّاً للمجتمع في ذلك الوقت وأسبابه. يُعتبر الحضور الحكومي عامل حيوي في نمو قطاع الفنون إلى جانب الحداثة والمعاصرة والتحولات الفكرية التي بدأت منذ السبعينيات، حيث تشكَّل في مجملها أساس متين واحد يعتبر بمثابة الجذور لكل ما هي عليه دولة الإمارات اليوم، وفي مكان كان يُنظر اليه نحو الفن باعتباره مجرد هواية، ظهرت صحوة قامت الحكومة والمؤسسات غير الربحية والقطاع التجاري ببث الروح فيها، وقد قطعت أشواطاً كبيرة، ستكون موضوع دراسات مكثفة في السنوات المقبلة. الفن هو جزء أساسي من البنية التحتية الاجتماعية والأكاديمية والثقافية في أي بلد، وكذلك هو واقع الحال في دولة الإمارات العربية المتحدة. منيرة الصايغ هي مسؤولة البرامج الخاصة بمتحف غوغنهايم في هيئة أبوظبي للسياحة والثقافة. وشغلت منصب "القيّم المساعد" في "تعابير إماراتية الرابع: ميادين الفنون "وشغلت سابقاً منصب "القيّم المساعد" لبرنامج (الفنان المُقيم) في آرت دبي، والمُنتج المساعد لمشروع جامعة نيويورك أبو ظبي للتراث الثقافي. A long-time resident of the UAE, Wouter Kingma is a commercial and editorial photographer who shoots extensive imagery for branding agencies and international lifestyle brands. In addition to photography assignments, Wouter and his team also produce award winning signature coffee table books. To date, he has been responsible for over a dozen unique limited-edition books. Wouter is passionate about capturing the beauty of Arabia whether be it through shooting desert landscapes, iconic architecture or the region’s magnificent history and heritage, so tightly woven into the fabric of the Middle East. Creating this book has been a true highlight of his professional career, thanks to the opportunity to immerse himself into the beautiful art of falconry and the pivotal role it plays in Arabia. An invitation to a traditional lunch at a falcon farm underpinned the extreme yet humbling hospitality the region is so known for and further demonstrated the respect due towards the sport of kings. Wouter loves to push boundaries, constantly striving to capture crisp and fresh imagery. He finds the shooting of birds especially rewarding, in particular when working in the different ‘on location studios’ and bringing in a Phase One medium format camera. Wouter extends a sincere thank you to all those who opened their doors, making Falcons of Arabia both possible and so enjoyable. A particular thank you goes to the team responsible for creating this book from copywriting and design, translation, calligraphy to the many hands involved in production. In recognition of his contribution to the industry, Wouter became the Middle East Ambassador for Canon in 2014. مصور محترف مقيم منذ فترة طويلة في دولة الإمارات العربية المتحدة، فوتر كينجما هو المصور التجاري ومصور التحرير الذي يعمل على التقاط الصور لعدد كبير من الوكالات والعلامات التجارية المرموقة. بالإضافة إلى مهام التصوير الفوتوغرافي، يبرع فوتر وفريقه في إنتاج كتب من القطع الكبير. وهو المسؤول عن انتاج نحو عشرات الكتب الفوتوغرافية محدودة الطبعة . بالإضافة الى تاريخها الرائع والتراث المنسوج بإحكام في الشرق الأوسط. وقد سلّط عمله في هذا الكتاب الضوء الحقيقي على مسيرته المهنية، وذلك بفضل الفرصة التي اتيحت له لينغمس في فن الصقارة الجميل والدور المحوري الذي تلعبه في الجزيرة العربية. وتشكل دعوة لتناول طعام الغداء التقليدي في مزرعة الصقور الطبيعة المضيافة والمتواضعة في المنطقة والاحترام الواجب تجاه رياضة الملوك. فوتر يحب دفع نفسه الى أقصى الحدود ويسعى باستمرار لالتقاط صور رائعة وجديدة. ويجد التقاط صور الطيور أمراً مجزياً ولا سيما عند العمل في مختلف 'المواقع " وفي تجهيز المرحلة الأولى من الصور التي يلتقطها بكاميرته. يمد فوتر خالص الشكر لجميع أولئك الذين فتحوا أبوابهم أمام الكاميرات، مما جعل من مجموعة صقور الجزيرة العربية أمراً ممكنا وممتعاً. والشكر على وجه الخصوص إلى الفريق المسؤول عن صنع هذا الكتاب من الاعلانات والتصميم والترجمة والخط والكثير من الأيدي التي شاركت في الإنتاج. وتقديرا لمساهمته في هذه الصناعة، أصبح فوتر سفير ":كانون" الشرق الأوسط في عام 2014. PSG is a multi-award winning international sports marketing agency with offices in the UK and Abu Dhabi. Since starting out in 1995, PSG has grown organically to establish itself as a market leading agency, with a dynamic and talented team who go above and beyond to deliver for a diverse range of clients worldwide, from corporate organisations and world famous brands, to sports governing bodies and governments, as well as sporting legends, the sports stars of today and rising stars of the future. Such work includes being The Boat Race’s exclusive sponsorship and communications agency since 2011 and helping the event move to gender parity in 2015; unique partnerships with global brands in golf such as Titleist, Footjoy and Troon Golf for over a decade; representing top Olympic athletes including Sir Matthew Pinsent, Tom Daley and the Brownlee brothers; and creating events such as the Brownlee Tri, the Abu Dhabi Solar Challenge, the Abu Dhabi Swimming Festival, ADNIC Yas Run & the Dolphin Energy Doha Dash. مجموعة بروفيشنال سبورتس PSG وكالةً دولية حائزة على عدة جوائز وتُعنى بالتسويق الرياضي، وتحقيق العوائد التجارية لعملائها. وتمتلك المجموعة مكاتب لها في كل من لندن، وأبوظبي. ومنذ تأسيسها في عام 1995، توسعت PSG واكتسبت سمعة طيبة بوصفها الوكالة الرائدة في التسويق الرياضي. وللشركة فريق عمل ديناميكي من الموهوبين الذين يسعون بكل جد إلى خدمة مجموعة متنوعة من العملاء في جميع أنحاء العالم، من المنظمات والمؤسسات والعلامات التجارية العالمية الشهيرة، إلى الهيئات الرياضية والحكومات، وكذلك لنجوم الرياضة الحاليين والصاعدين. ومن ضمن الفعاليات التي عملت عليها الشركة: الرعاية الحصرية لسباق القوارب والهيئة الرسمية للتواصل الإعلامي منذ عام 2011 ومُساعدة الحدث على تحقيق المُساواة بين الجنسين في عام 2015؛ وهي شراكة بين علامات تجارية مرموقة في مجال رياضة الجولف مثل، تيتليست Titleist، فوت جوي Footjoy ، وترون جولف Troon Golf، لمدة تزيد على عقد من الزمن؛ والتمثيل الرياضي لبعض من أشهر رياضيي الأولمبياد مثل السير ماثيو بينسنت، وتوم ديلي، والشقيقين بروان لي؛ وصنع أحداث رياضية مثل براون لي تراي، ومُسابقة أبوظبي للسيارات الشمسية، ومهرجان أبوظبي للسباحة، وأركض في ياس مع أدنيك، وسباق الدوحة للمسافات القصيرة. With more than 2000 people including over 450 investment professionals based in North America, Europe and Asia, we manage US$506 billion(1) of assets across developed and emerging market equities, fixed income, asset allocation solutions and alternatives. Columbia Threadneedle Investments is the global asset management group of Ameriprise Financial, Inc., a leading US-based financial services provider. As part of Ameriprise, we are supported by a large and well-capitalised diversified financial services firm. *All figures as at 31 March 2015. Columbia Threadneedle Investments is the global brand name of the Columbia and Threadneedle group of companies. (1) Source: Ameriprise Financial Q1 2015 earnings release. كولومبيا ثريدنيدل للاستثمارات مجموعة رائدة في إدارة الأصول العالمية توفر مجموعة واسعة من استراتيجيات الاستثمار المدارة بفاعلية وتقدم الحلول الاستثمارية للعملاء من الأفراد والمؤسسات والشركات في جميع أنحاء العالم. وتضم أكثر من 2000 شخص من بينهم أكثر من 450 من خبراء الإستثمار في مقارها في أمريكا الشمالية وأوروبا وآسيا، وتدير مجموعة الولايات المتحدة 506 مليار دولار من الأصول (1) من الأسهم في الأسواق المتقدمة والناشئة، واستثمارات الدخل الثابت، وحلول توزيع الأصول والبدائل. كولومبيا ثريدنيدل للاستثمارات هي مجموعة إدارة الاصول الدولية التابعة لمؤسسة أميريبرايز المالية، وهي مؤسسة تعمل على تقديم الخدمات المالية ومقرها في الولايات المتحدة. وكجزء من أميريبرايز، فإننا نتلقى المساندة من قبل شركة خدمات مالية كبيرة ذات رؤوس أموال ضخمة ومتنوعة. We are delighted to invite you to the third Dolphin Energy Doha Dash at Losail International Circuit on 10 February 2015. There will be interview opportunities with event ambassador Dame Kelly Holmes, and Dolphin Energy delegates. The event starts at 7:00am and will run until 1:00pm, with a variety of races throughout the day- a 1km kids race, a 1km ladies’ walk, a 3km race, and a 5km race in which Dame Kelly Holmes will be competing. The event is supporting The Shafallah Centre and all donations raised will go toward building a new playground for the centre. يسرنا دعوتكم الى سباق دولفين الدوحة للمسافات القصيرة على مضمار حلبة لوسيل للسباقات الكبرى في 10 فبراير 2015. ستتاح لكم فرصة إجراء مقابلات مع سفيرة السباق بطلة الأولمبياد ديم كيلي هولمز، ووفد شركة دولفين للطاقة. يبدأ الحدث الساعة 7:00 صباحاً ويستمر لغاية الساعة 1:00 ظهراً، يتخلل الحدث العديد من السباقات منها سباق 1 كم للأطفال، وسباق مشي 1 كم للسيدات، وسباق جري 3 كم، وسباق جري 5 كم حيث تشارك البطلة كيلي فيه. يدعم الحدث مركز الشفلح للأطفال ذوي الإحتياجات الخاصة وستخصص جميع التبرعات لبناء ملعب جديد للأطفال في المركز. The Excellence One Toolbook is a practical set of tools that you can use with the teams you lead. It encompasses the templates, checklists and help-cards you need to make a difference. Kept to an optimal number, they provide a comprehensive coverage of techniques that can be applied across the EFQM Excellence Model. Seek some guidance. Look for advisor. But more than anything else, dare to use such tools on regular basis. No one will find you too systematic, annoying or slow as you will all discover together how to make things happen much faster and with enthusiasm as a gift.The best coach is your own hope, the best teacher is practice and the best reward is happiness. يقدم هذا الكتاب لمحة سريعة حول قيمة نموذج التميز من الدرجة الأولى. وهو كتاب ستجد لديك رغبة في حمله في حقيبتك نظرًا لاحتوائه على مجموعة من الأدوات العملية التي يمكن استخدامها مع فرق العمل التي تقودها. ويحتوي هذا الكتاب على النماذج والقوائم وبطاقات المساعدة التي تحتاجها لتصنع الفارق. وبعد أن تم إصداره في أفضل عدد، تقدم تلك الأدوات تغطية شاملة للتقنيات التي يمكن تطبيقها عبر نموذج التميز للمؤسسة الأوروبية لإدارة الجودة. ومن خلال الموقع الإلكتروني ستجد مجموعات تعليمية تقدم توصيفا لمنهجيات التميز والتي من شأنها أن توفق بين النتائج المتفاوته وذات الصلة. يدعم الكتاب أنشطتك اليومية من خلال تزويدك بالإرشادات اللازمة لإنجاز الأشياء وما عليك إلا أن تتعلم كيفية استخدام الأدوات وتطبيقها والتأمل فيما تعلمت شيئاً فشيئاً ومن ثم سوف تنمي قدراتك الفردية وتصبح ذو مهارة في تقديم التسهيلات للفريق واختيار الأدوات الصحيحة بل وابتكار الأدوات التي تحتاجها. اسع للحصول على بعض التوجيهات وابحث عن مستشارك. ولكن ما هو أهم من أي شئ آخر هو الإقدام على استخدام تلك الأدوات استخداما منتظما. ولن يشعر أحد أنك إنسان نمطي أو مزعج أو بطيء طالما أنك ستكتشف فجأة طريقة إنجاز الأشياء بصورة أسرع كثيرا وبشيء من الحماسة وكأنك أصبحت موهوباً فيها. ويبقى أملك هو خير ملهم وممارستك هي أفضل معلم وسعادتك هي أفضل جائزة لك. 1. أنت بحاجة لفهم المبادئ والممارسات التي اكتشفت على مدار القرن الماضي من التطوير والتحسين المؤسسي واستيعابها والعيش بها ومشاركتها مع الآخرين. 2. أنت بحاجة لإتقان واستخدام ومشاركة الأدوات التي لها صلة باحتيجاتك واحتياجات مؤسستك. Careers in Consulting, Business Management and Professional Services consist of working directly with organisations to provide advice by gathering information on problems and requirements and recommending and implementing improvements. This may be in different fields such as management strategy, business processes, legal requirements, information technology or financial matters. Work activities typically involve talking with clients and organisation representatives and gathering data and documentation to better understand requirements and problems. Activities are often project based and require detailed planning of tasks and monitoring of progress to ensure timelines and milestones are met. Professionals in this field are often required to produce reports and documents on their recommendations. In addition to delivering of projects, individuals in Consulting, Business Management and Professional Services are often required to seek out new clients and projects by building and maintaining trusted relationships with company representatives, and by preparing and presenting detailed proposals and bids for services based on client requests. تنطوي الوظائف في مجال الاستشارات، وإدارة الأعمال، والخدمات المهنية الاحترافية على العمل مباشرة مع المؤسسات لتقديم المشورة من خلال جمع المعلومات عن المشاكل والاحتياجات وتقديم التوصيات وتنفيذ التحسينات. وقد يكون هذا في مجالات مختلفة مثل استراتيجية الإدارة، والعمليات التجارية، والمتطلبات القانونية وتكنولوجيا المعلومات أو الأمور المالية. كما تقتضي أنشطة العمل عادة التحدث مع العملاء وممثلي المؤسسات وجمع البيانات والوثائق لفهم المتطلبات والمشاكل على نحو أفضل. وغالبا ما تكون الأنشطة مبنية وقائمة على المشروع وتتطلب التخطيط التفصيلي للمهام والواجبات ومراقبة مدى التقدم المحرز لضمان تلبية واستيفاء الجداول الزمنية والمعايير الرئيسية. غالبا ما يطلب من المحترفين العاملين في هذه المجالات إعداد وإنتاج التقارير والوثائق بناءً على توصياتهم. بالإضافة إلى تنفيذ المشاريع، غالبا ما يطلب من المحترفين العاملين في هذه المجالات البحث والسعي عن عملاء جدد ومشاريع جديدة من خلال إقامة وإدامة علاقات موثوقة مع ممثلي الشركات، وإعداد وتقديم المقترحات والعروض التفصيلية للخدمات القائمة والمبنية على طلبات ومتطلبات العميل. Our amazing team that works within the hotel is here for you. Through our enthusiasm, smiles and great service, we are positive that we will make our hotel your home away from home. make your stay very enjoyable. Wishing you a most enjoyable stay and we look forward to welcoming you back in the near future. يعمل فريقنا الرائع بالفندق بكل حماس وفرح وخدمة ممتازة من أجلك لأننا على ثقة من أننا سنجعل من فندقنا بيتك الثاني. تلائم أماكن الإقامة لدينا كل مسافر سواء كان في رحلة عمل أو للترفيه لا سيما وأن وسائل الراحة لدينا كفيلة بجعل إقامتك مريحة وممتعة للغاية. ويشتمل الدليل على جميع الجوانب الرئيسية التعلقة بمنشآتنا والمنطقة؛ وإن كنت بحاجة إلى مزيد من المساعدة يرجى الاتصال بأحد خبراء فريق خدمة العملاء في الاستقبال. نتمنى لكم إقامة ممتعة ونتطلع إلى الترحيب بكم مرة أخرى في المستقبل القريب. during your stay and as well to facilitate billing and payment collection procedures. تلبية احتياجات وتوقعات ضيوفنا هي دائما من أهم أولوياتنا، ويشمل ذلك حماية حقهم في الخصوصية وحماية أي معلومات شخصية يزودونا بها أثناء إجراءات الحجز. كما تتم معالجة هذه المعلومات من خلال أنظمة الكمبيوتر وتأمينها بعناية فائقة. وتستخدم هذه المعلومات لتوفير أماكن الإقامة للنزلاء وغيرها من الخدمات ذات الصلة التي يحتاجها النزلاء أثناء بقائهم في الفندق كما وتستخدم أيضاً لتسهيل إجراءات الفواتير والدفع. From the timeless tranquility of the desert to the lively bustle of the souk, Dubai offers a Kaleidoscope of the attractions for visitors. The emirate embraces a wide variety of scenery in a very small area. In a single day, you can experience everything from rugged mountains and awe-inspiring sand dunes to sand beaches and lush green parks, from dusty villages to luxurious residential districts and from ancient houses with wind towers to ultra-modern shopping malls. Dubai is both a dynamic international business center and a laid back tourist escape; a city where the sophistication of the 21st century walks hand in hand with the simplicity of a bygone era; a cosmopolitan society with an international lifestyle combing the comfort and convenience of the Western world with the unique charm and hospitality of Arabia. من هدوء الصحراء إلى صخب المدينة، تعدّ دبي من أجمل مناطق الجذب للزوار حيث تحتضن الإمارة مجموعة واسعة من المشاهد الخلابة في منطقة صغيرة جداً. في يوم واحد، يمكنك تجربة كل شيء من الجبال الوعرة والكثبان الرملية المذهلة إلى الشواطئ الرملية والحدائق الخضراء المورقة، ومن القرى القديمة إلى المناطق السكنية الفاخرة، ومن البيوت العتيقة بأبراج التهوية إلى مراكز التسوق الحديثة. تعتبر دبي مركزاً للأعمال التجارية الدولية وملاذاً للوجهات السياحية على حد سواء؛ حيث يتماشى تطور القرن الحادي والعشرين جنباً إلى جنب مع بساطة الحقبة الماضية. وينخرط مجتمعها مع أسلوب الحياة العالمي ليشكل مزيجاً من انفتاح العالم الغربي مع سحر الضيافة العربية الفريد. The history of Dubai can be tracked back to the year 1830 when it was taken over by a branch of the Bani Yas tribe from the Liwa Oasis, led by the Maktoum family, who still rule the emirate today. In 1894, Shiekh Maktoum Bin Hasher Al-Maktoum, the ruler of Dubai, exempted foreign trade from taxes, making way for Dubai’s modern development –starting with local merchants selling items like pearls, fish, spices and dates. Traders from India and Persia were also attracted to Dubai because of the liberal attitudes of the rules, and soon began to settle in the growing town, which developed a reputation as the leading commercial center for the region. Trade was based around the safe, natural anchorage of the creek, which was and still is the visual and commercial heart of the city, with numerous dhows still sailing to other countries. Dubai is simultaneously a dynamic, international business center and a relaxing tourist destination. These features make Dubai a truly cosmopolitan place; but the rich history of the emirate also provides a culture deeply rooted in the Islamic traditions of Arabia. At the same time, Dubai is a very tolerant and welcoming place for foreigners, with visitors free to follow their own religions. Drinking alcohol in hotels and licensed health and sports clubs is permitted for non-Muslims. Dress code is liberal for visitors to the emirate. Women are free to drive and go out unaccompanied, making Dubai a very relaxed place to visit; however, it is important for visitors to respect their hosts and abide by local regulations. Each year during the holy month of Ramadan, Muslims abstain from eating, drinking and smoking from sunrise to sunset. The fast is broken each day with the Iftar at sunset. During the holy month of Ramadan, visitors also must take care not to eat, drink or smoke in public placed. The dates of the Islamic holidays are not fixed on the Hijri (Islamic) calendar, as they are based in the sighting of the moon. Holidays are frequently announced less than 24 hours in advance. يعود تاريخ دبي يمكن إلى عام 1830، حين استوطن فيها فرع من قبيلة بني ياس من واحة ليوا، بقيادة عائلة آل مكتوم، التي لا تزال تحكم الإمارة حتى يومنا هذا. في عام 1894، قام الشيخ مكتوم بن حشر آل مكتوم، حاكم دبي، بإعفاء التجارة الخارجية من الضرائب، مما مهد الطريق لتطوير دبي الحديثة ابتداءً بسلع التجار المحليين مثل اللؤلؤ والسمك والتوابل والتمور، الأمر الذي جذب التجار من الهند وبلاد فارس أيضاً إلى دبي بسبب انفتاح وتشجيع القوانين الخاصة بالتجارة، وسرعان ما بدأ الاستقرار في المدينة المتنامية التي نالت سمعة مرموقة باعتبارها المركز التجاري الرائد في المنطقة. تركزت التجارة في مرسى الخور الطبيعي الآمن، الذي كان ولا يزال القلب المرئي والتجاري للمدينة، مع العديد من المراكب الشراعية التي لا تزال تبحر إلى بلدان أخرى. الحركة في دبي دوماً مستمرة، فهي مركز للأعمال التجارية الدولية ومقصد سياحي للاسترخاء. كل هذه الميزات تجعل دبي مكاناً عالمياً بالفعل. كما ويوفر التاريخ الغني للإمارة ثقافة عميقة الجذور من التقاليد الإسلامية العربية. تعتبر دبي بيت التسامح والترحيب بالأجانب حيث يمارس زوارها طقوسهم الدينية. وفي الوقت نفسه. يسمح لغير المسلمين شرب الكحول في الفنادق أوالأماكن الصحية المرخصة أوالأندية الرياضية. اللباس هو حرية شخصية لزوار الإمارة. ويسمح للمرأة بالسواقة والخروج بدون مرافق، مما يجعل دبي مكاناً مريحاً جداً للزيارة. ومع ذلك، فمن المهم للزوار احترام هذه الضيافة والالتزام بالاعراف المحلية. في خلال شهر رمضان المبارك من كل عام، يمتنع المسلمون عن الأكل والشرب والتدخين من شروق الشمس الى غروبها. ويفطر فيه المسلمون عند غروب الشمس من كل يوم، ويحرص خلاله الزوار على عدم تناول الطعام والشراب أو التدخين في الأماكن العامة. تواريخ الأعياد الإسلامية ليست ثابتة على رزنامة التقويم الهجري وإنما تعتمد على رؤية الهلال. وغالباً ما يُعلن عن العطل في أقل من 24 ساعة. اللغة الرسمية للبلاد هي اللغة العربية، ولكن معظم الناس داخل وخارج مكان العمل يتواصلون باللغة الإنجليزية. وهناك الكثير من الجنسيات المختلفة في دبي، وبالتالي تعتبر اللغة الإنجليزية طريقة تواصل مشتركة لدى الغالبية. معظم الطرق، واللافتات، وقوائم المطاعم مكتوبة باللغتين الإنجليزية والعربية.